Achieve salon-worthy results with Red Carpet Manicure's 'Grace and Lace' Nail Polish; a pink glitter nail varnish from the brand's Bloom Style collection. 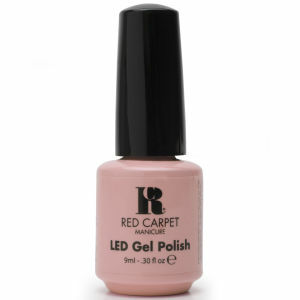 Curing under an LED lamp, the gel polish glides on effortlessly and delivers long-wearing, cushioned colour with a chip-resistant finish that lasts for up to three weeks. Safe for natural nails. Nägel vorbereiten. Immer zusammen mit Basis- und Decklack verwenden. 45 Minuten unter dem professionellen LED-Licht der Marke trocknen. Di-Hema Trimethylhexyl Dicarbamate, Butyl Acetate, Ethyl Acetate, Hema, Hydroxypropyl methacrylate, Nitrocellulose, Isobornyl methacrylate, Hydroxycyclohexyl phenyl ketone, Violet 2/CI 60725, Dimethicone, Citric Acid, Diacetone Alcohol, Stearalkonium Hectorite, Phosphoric Acid, Titanium Dioxide, Black Iron Oxide, Red Iron Oxide, D&C Red #7, D&C Red #34.